uPlay Tablet is a high tech company headquartered in the heart of Silicon Valley and with manufacturing factories in Shenzhen, China–the same place that the Apple iPad is made–that focus on tablet computers. Our fab 1 has 45,000 square feet clean room, 300 operators, 30 of them are QAs. The production capacity is 70,000 units per month. Our fab 2 has 110,000 square feet clean room, 500 operators, 40 of them are QAs. The production capacity is 100,000 units per month. The R&D team has 70 engineers. All factories are certified with the ISO9001 international quality system standard. All of our tablets have passed CE,FCC,ROHS,CCC certifications. uPlay wireless keyboard and aluminum case for iPad 2–Ranked in the top 3 best-selling iPad 2 keyboards on Amazon.com. uPlay (TM) PhonePad – A 7 inch 3G Tablet, Un-locked Phone, and GPS with Capacitive Touch Screen – The first 3-in-1 tablet /phone/GPS. We offer customized Android tablets for your own special applications. You can put your own brand, logo or animation on the tablet, pre-install your own apps, and configure the OS to do exactly what you need. The customized possibilities are endless. We provide tablet hardware and software utilities for you to create your own customization. We are located in Silicon Valley, so you don’t have to worry about long-distance communication or quality of the service. If you are interested in customizing your tablet or purchasing for wholesale, please email us at info at uPlayTablet.com (if you are a human, you know that “at” means “@”), or call +1 (650) 918-6188. We help Chinese tablet manufacturers build their brand name and to market and distribute their tablet products to the world, particularly, to the consumers in the U.S. market. One of our clients is woPad, the black horse in the tablet market in China. For more details, check out woPadUSA.com. We are also the North America distributor of Ainol Electronics. Ainol’s NOVO 7 tablets won the “Best Tablet Reward” the 2nd Place at CES 2012. Our goal is to offer our customers the best customer service. 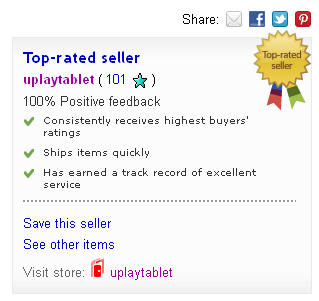 Our uPlay Tablet eBay store made into eBay “ Top Rated Seller ” and “Power Seller” in just 6 months at eBay’s first review , because we have 100% positive feedback from customers, we consistently receive the highest buyers’ rating , we always ship items in 24 hours and provide tracking number, and always reply to customers’ email in 12 hours (we earned a track record of excellent service).